They view technology as a given, not a reward or piece of equipment. It is a necessity [Thrivist]. In fact, Seventy-nine percent of Generation Z consumers display symptoms of emotional distress when kept away from their personal electronic devices [CMO]. The average Gen Zer has the attention span of about eight seconds. They have grown up at a time when they're being served media and messaging from all angles, and have adapted to quickly sorting through and assessing enormous amounts of information [CMO]. These consumers are digital natives, but even more so, mobile first. They are twice more likely to want to shop on a mobile than Millennials [Forbes]. To add to that, they spend 8-9 hours per day connected to at least one form of media [Thrivist]. They find email an outdated communications method, and are 3x likelier to open a chat message received through a push notification. They value privacy meaning the best way to reach them is via private forums than broadcast media likeTwitter and Facebook [Forbes]. Gen Z spends less time than any others in human history using conversation to communicate [Thrivist]. 63% are concerned when it comes to protecting their identity when paying with a debit or credit card online or in a retail store [Gen HQ]. Consumers 19 and younger prefer social networks like Snapchat, Secret, and Whisper, and a quarter of 13- to 17-year-olds have left Facebook this year [CMO]. 57% would rather save money than spend it [The Intelligence Group]. Why? Their top financial goals are buying a car (33%), paying for education (23%) and buying a house (20%) [Visa]. They have more purchasing power than any previous generation did at a comparable age [Thrivist]. In fact, Gen Zers influence $600 billion of family spending [CMO]. Now let’s try to process this. When members of Generation Z are using their phones to browse and compare financial institutions, how confident do you feel that your website and offerings will stand out against the big banks and fintech startups? What changes will you have to make to provide satisfactory service to a generation that doesn’t remember life before smartphones and Amazon? In Part 2 of this blog, we’ll dive deeper into Generation Z. We’ll further discuss what it means for your financial institution and how you can begin preparing immediately for this inevitable alteration to the financial services industry. Don’t miss part 2! Subscribe to The Decision Maker today so you don’t miss a thing. 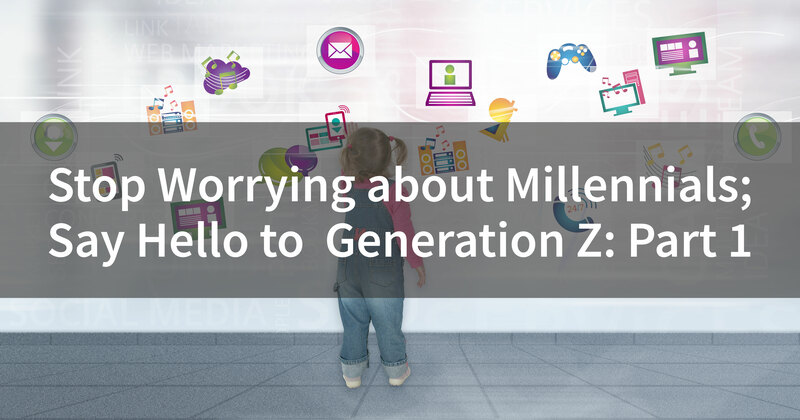 Read now: Stop Worrying about Millennials; Say Hello to Generation Z: Part 2.